The past few weeks have been rocky. That is, life is good, but even when things are going good, bad things can happen and make everything really bad. And that is how Moosie came to us. I remember the day we adopted him. He was in a cage in the hallway, as the shelter has a massive influx of cats. They had named him “Cowboy,” because he was spotted like a holstein cow. 🙂 I especially liked his beautiful long fur. Moosie was always such a sweet cat…seriously, the sweetest thing. A couple times he got a lion cut during the summer, because no matter how hard we tried to keep up with the spring shed, he got some knots. Each time I went to pick him up, the ladies commented how “He is the nicest cat we’ve ever done! He didn’t fuss at all!” He was always such a sweet-natured kitty. Big, too; I called him the Gentle Giant. …so it really hurts my heart to think my sweet Moussaka is not doing so well. He seems comfortable right now; in his little hut, as I call it, resting and getting gentle pets. My mom wanted to wait until my dad came home from work to make any decisions, and I have to respect that. He doesn’t seem to be in pain, so I can respect that. Maybe this was just a fluke and I’m being premature. But I told him I loved him at least a dozen times this afternoon, and I gave him gentle hugs, and I stroked his lovely soft fur. But my heart is breaking, because I want him to be 100%. I want him to be OK. I want my grandma to be OK. And I don’t want my mom to have to deal with this. This was the last of her “original three,” so I know she is taking it especially hard, *especially* with everything going on with my grandma. Why does it all have to happen at once? 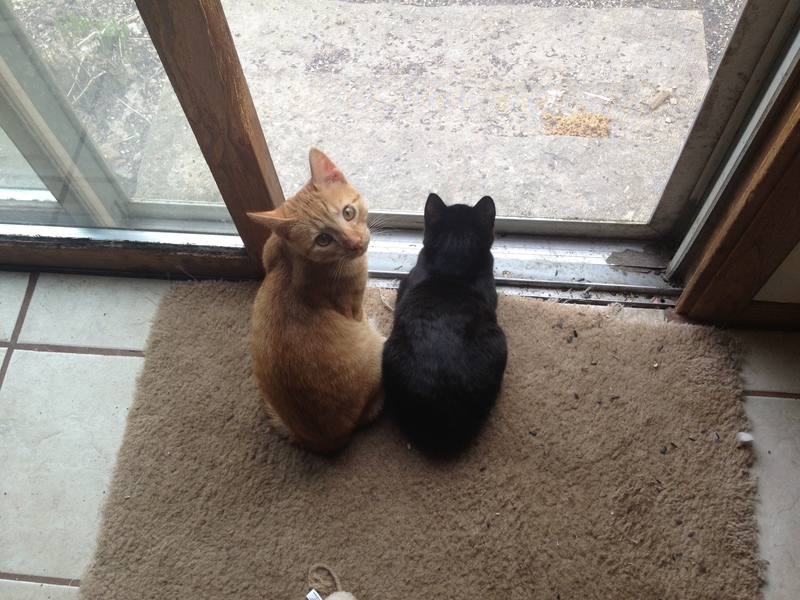 Last year my mom adopted Tom (orange tabby) and Pearl (black cat). My mom loves them both, but she and Pearl have formed an incredibly tight bond. I know firsthand how you can’t substitute one cat for another, and I know there will never be another Moosie, but I am so thankful for Tom and Pearl, that they can offer some comfort during this time. 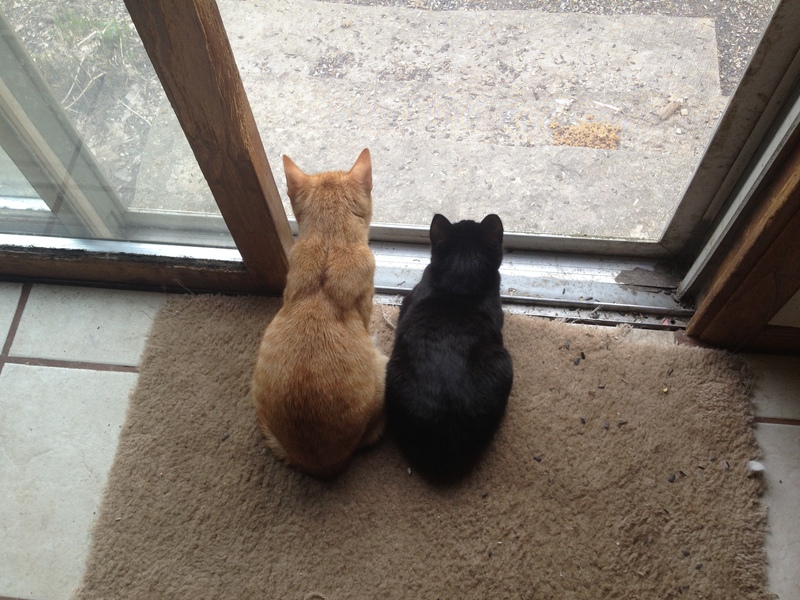 …and, of course, I am so thankful for my furkids. You can bet they will be getting extra hugs and kisses tonight. I had tears streaming down my face as I read your post, Susan. I’m so sorry about Grandma and Moosie. I am praying for the both of them. I know what you and Mom are going through and my heart goes out to the both of you. Loved the picture of Tom and Pearl. Our babies are a tremendous comfort when we are dealing with a crisis. They are our angels. God bless. I’ve found that by focusing on what you still have instead of being keenly aware that the end is near, it makes it a little easier to get through it with out mourning before they have passed. Purrs to you that you find more times of peace and make some wonderful memories while you can. I’m so sorry about your grandma. . and Moose. Email me if you want to talk.